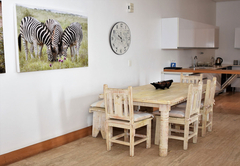 The Square 3 is a property providing self catering in Plettenberg Bay for up to 4 guests visiting the Garden Route region. 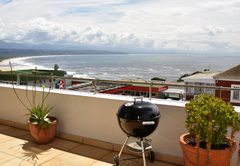 Situated on the main street in Plettenberg Bay, The Square 3 is a self-catering apartment for four guests. 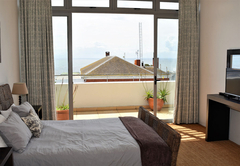 This upstairs apartment has lovely views and is conveniently above a shopping area. 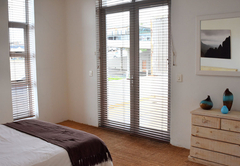 There is a security door that leads from the shopping area to the apartments and a lift. 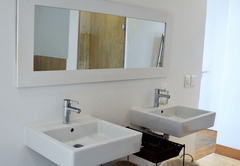 There is also a separate parking area for residents. 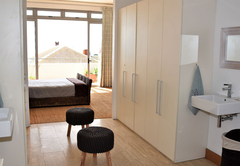 The Square 3 Holiday apartment has two bedrooms both with an en-suite bathroom each. 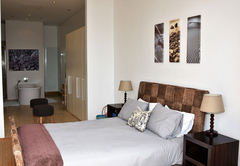 The main and second bedrooms each have a double bed and the en-suite bathrooms have both a bath and a shower. 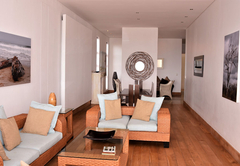 There is an open plan kitchen and living area. 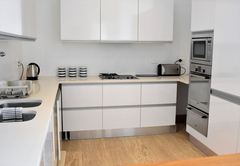 The kitchen is fully equipped for self-catering and includes a dishwasher, stove, oven, fridge / freezer, microwave, cutlery and crockery. 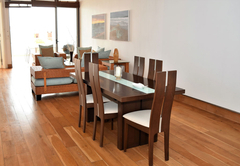 There is also a breakfast table with seating space for six people. 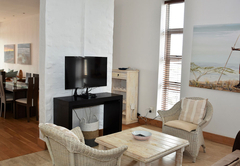 The separate dining area has seating space for six people, while the lounge has a lounge suite and a TV with full DStv channels. 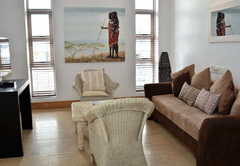 The living area opens up onto a patio which has an outdoor table and braai facilities. Response timeThe Square 3 typically responds to requests in 5-10 minutes.